I've done it! Pollock, I've cracked it wide open. I think. Brace yourself for this little piece of abnormal psychology alla Poppy, my ultimate food chart! Man, I had just about given up on this and ::click:: it all fell into place. Or well, I think what happened is that my schedule clicked into place and hopefully will be staying in place long enough for me to build my little house on the prairie. See I upset myself last fall trying to come up with monthly food charts, that's changing gears too fast for me. I really prefer changing gears every thirteen weeks: stumbling the first few weeks over recipes I haven't made in a year, getting the hang of them again, being able to do them with my eyes closed, and then time please to switch it up again. 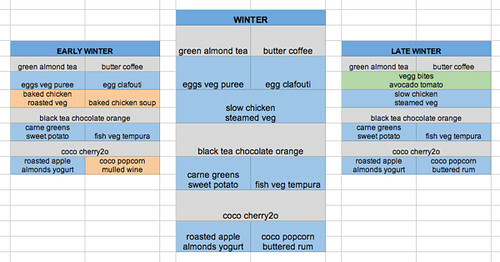 It's not about having a unique food chart for each month; it's more about having a unique food chart for each key month, i.e., the key month of each season, e.g., February for winter, May for spring, August for summer, and November for fall, and hybrid food charts for the between months. So for example, January has pieces from the fall and winter charts, March has pieces from the winter and spring charts, and how do you know which pieces? You just pick them, whichever ones work. Well, we'll see! All this is contingent on my life chart staying the course, I'd reeeally like to run with this for a while. As long as I've had this blog, my schedule—which is to say, my life—has largely been at the mercy of when there were practices that could be picked up, and it's been transition after transition, from Derby Lite to WCR, from Rioter to Fury, from preseason to home season to postseason, from home team to travel team and back again, but maybe, finally, derby-wise, I am who I am? Not to mention the whole knock knock and barfing stars thing, that also happened. And I'm not saying that I'm done changing, obviously not, hopefully not. Can I be this for a while, though? Work MWF, cook and blog Tue Thu, practice Sun Mon Thu, train Tue Wed Sat, and rest Fri Sat? So every month, I am going to post the month's chart. Disclosure: I'm on blog time, so I'll be posting the chart I did last month, but, CLOSE ENOUGH. So like, I've been cooking off the early winter chart all December to be posted in January. You will see, next week. I'll be amazed if I'm able to use this for the entire year. It will be constantly updated, like already I'm over black tea and chocolate. Sad to say, chocolate has been giving me headaches. Now I just have black tea and cuties for the orange, I'm all about cuties right now.